HAMPTON, Va. (Jan. 18, 2018) — The Hampton University Museum, celebrating its 150 anniversary, presents the “Pathways to Education” exhibit, celebrating 150 years chronicling the History, Legacy and Legend of Hampton University, opening Friday, Jan. 26 at 5:30 p.m. The History exhibit features the curiosity room, a collection of objects solicited by Hampton University Founder, Brig. Gen. Samuel Chapman Armstrong. The exhibit highlights Armstrong’s intention to use objects as instructive and integral tools to his educational philosophy of teaching by the most practical method. The Legacy exhibit highlights the storied history of Hampton University from 1868-2018, from its early days as a Normal, Industrial and Agricultural trade school, educating former enslaved African – Americans and Native Americans to the world-class research institution it is today. 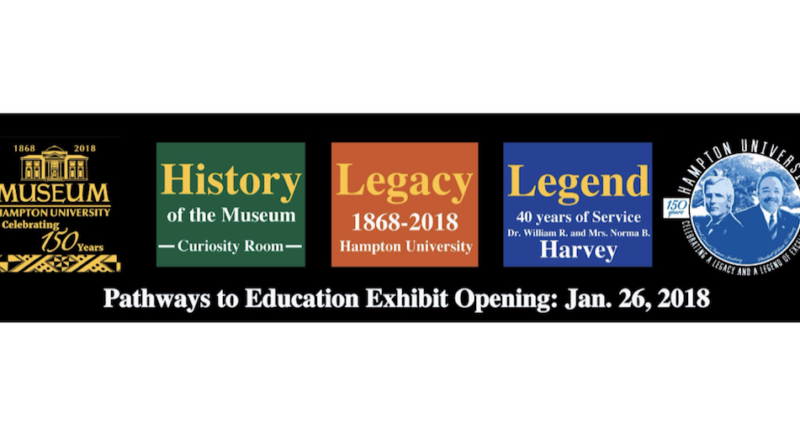 The Legend exhibit will take you on a journey of the unparalleled leadership of Dr. William R. and Mrs. Norma B. Harvey, celebrating 40 years of dedicated service to Hampton University. An astute businessman, Harvey has balanced the schools budget every one of his 40 years in charge. More than 70 academic programs have been introduced, including a host of Ph.D. disciplines, and 26 new buildings have been constructed on campus.